The following section describes fourth and fifth steps of process deployment, as described in From Studio to the cloud. In this step, you apply a deployment package into a target environment (e.g, testing or production). •Applying a deployment package is a task that needs to be properly planned, coordinated, scheduled and communicated. It implies planned downtime for the service. •Make sure the Automation Service environments you are going to import the package into has been created, even if it has not been in use yet (i.e., testing, production). If you have not created a project yet, follow the steps described at Create a new project in Automation Service, and review whether you are using a Personal, or an Enterprise subscription. The person in charge of this step should be authorized to administer Automation Service environments. This person does NOT need to be technically skilled since no programming or IT-related tasks are involved. A self-service UI guides the person in charge of this step through the process. Note that the Import processes option is available in the online Management portal available through your Automation Service subscription. •To have access to the deployment package (.bex file) created in the previous deployment step. •Internet connectivity and a browser to access the Management portal at https://manage.bizagi.com (as well as credentials with authorized access). The person does NOT need access to Bizagi Studio (the Development environment). 1.Access the Management portal and locate your target environment. 2.Temporarily stop your Automation Service service for the target environment (for Enterprise subscriptions). 3.Upload and apply the deployment package. 4.Verify the log to confirm a successful deployment. 5.Start up your Automation Service service for that target environment (for Enterprise subscriptions). 6.Verify your processes and service. Follow the steps as detailed below. 1.1. Open a browser (Chrome is preferred) and go into https://manage.bizagi.com. 1.4. Locate your target environment. Double-check that you are preparing to deploy into the correct environment. Testing environments are identified by the icon. Production environments are identified by the icon. 2.1. Stop your chosen environment's service by clicking the Window maintenance option. This is required for a successful deployment. We recommended that you schedule and perform deployments at non-busy hours, and announce in advance a maintenance period in which the service will not be available. 2.2. Enabling the Maintenance window option, temporarily stops the service. This makes it possible to import processes into that environment. 3.2. 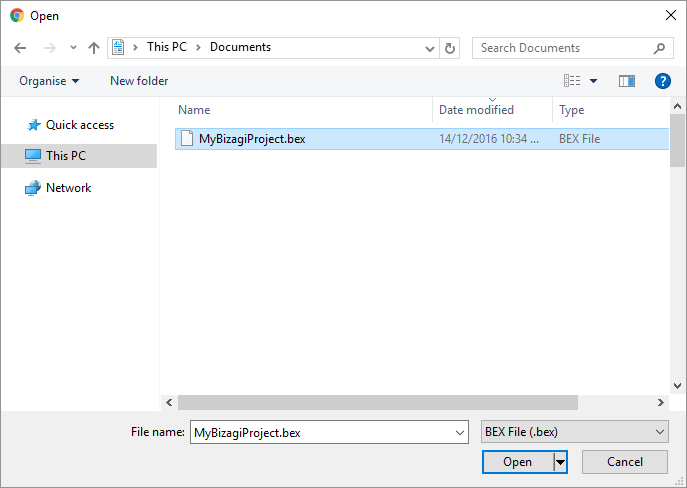 Select the .bex file containing the deployment package. Note that the file name given has no functional significance. However, make sure you are uploading the correct file. You should also see the latest applied deployment package appear under the environment's name. Even though the package has been imported, you must confimr that overall changes (imported processes, new process versions, etc.) behave as expected in your target environment. You may rely on logs for this, if there is a problem, you can roll back a deployed package so that your environment is restored to its immediate previous state, as described next. Rolling back a deployed package is available for non-Production environments like a testing or Staging environment. •A log for each package, regardless of whether the deployment succeeded or failed. •The full list of deployment logs available with the most recent log at the top of the list. •The log details the name of the package, a timestamp of its application date, and the name of the user who made the deployment. •The latest applied package presents a icon. Click it to roll back that package and restore the environment to its previous state (not available for a Production environment and only available for Enterprise subscriptions). •Click a row to download a previously applied package. 4.2. If you want to review not just the log, but also the deployment package you applied, you can download it. Once you have downloaded the deployment package, you can open it with Bizagi Studio to review the objects it contains. 5.1. Start your service up again by clicking the Maintenance Window option, which should be highlighted. Once this is completed, The maintenance window option returns to its disabled state (its icon not highlighted). 6.2. Once you have confirmed that your deployment was completely successful, via Bizagi confirmation messages, logs, and your own tests, you are done. You may announce to end users that your new processes and versions are available. On the other hand, if you detect that something is not behaving as expected, or you realize that your imported deployment package did not contain the changes, or all the changes, you wanted to deploy, you can roll back the deployment (available in Enterprise subscriptions). •This is available for changes deployed to a testing or Staging environment, not to a Production environment. •You can roll back the latest deployed package only, and cannot restore to earlier states of the environment. •This option is available for 30 calendar days after you import a package. It is not available for deployed packages older than 30 days. When you perform your first import, you need to synchronize users to have authorized users on your target environment. At this point you have completed with a process deployment with Bizagi. There is no formal next step. However we recommend that you review your deployment experience and, if necessary, adjust the preparations you make for incremental deployments in the future. For more information about this topic, refer to Continuous improvement and incremental deployments.